Who’s super excited about the Australia Day Long Weekend? Weeee are! I mean what’s not to be excited about … a long weekend, all sorts of events and activities all over every city and town across the country and the perfect excuse to have a bunch of friends around for an Awesome Aussie BBQ! This year we’ve been inspired by Ingham’s and their fabulous range of Chicken and Turkey products and thought you might like a little inspo too … here’s our Top 4 Australia Day ‘Finger Food’ Recipes. No washing up required (yaaaaas)! These TURKEY MINCE ONION RINGS are a load of fun, delicious on their own or with a topping of tomato or BBQ sauce (so Australian). And just so easy to make. Literally 10 minutes and these Turkey Mince Onion Rings will be sizzling away. Serve as finger food or you could get really healthy and serve with a salad. Watch the RECIPE VIDEO ☝through for the super easy how to or check out the full RECIPE for exact details. Everyone loves a Chicken Skewer … but they’re especially delicious with this delicious marinade from MoM Member ‘Mum2Archer’. 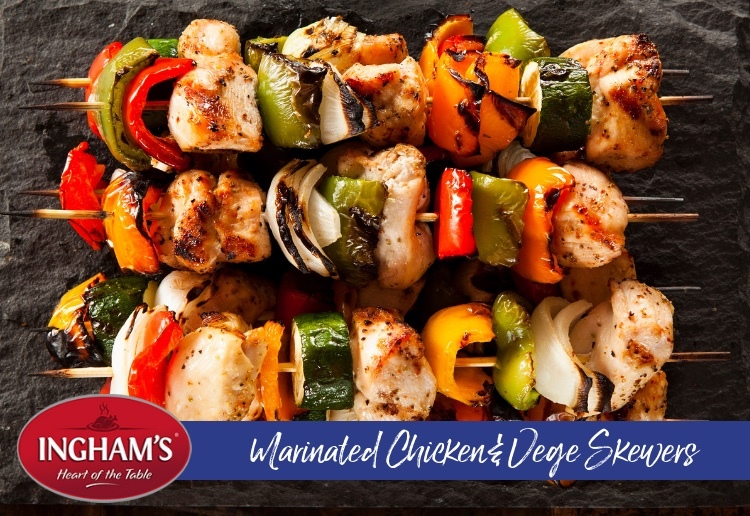 Check out her MARINATED CHICKEN & VEGE SKEWERS RECIPE for the marinade ingredients. Have a little more fun if you like – add a fresh green bean or two, a stalk of asparagus or some eschallots into the roll or even a little stick of cheese. 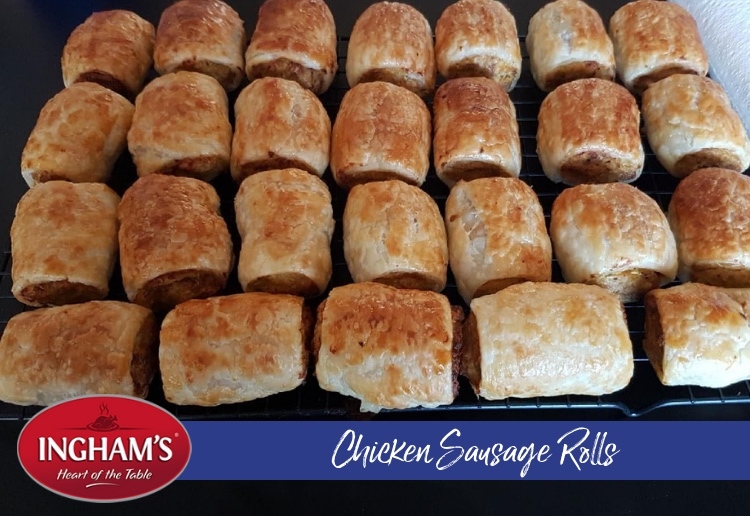 If you think you’ll use the leftovers for school lunches next week, you’d better make a triple batch of MoM Member Lisa’s CHICKEN SAUSAGE ROLLS … chock full of goodness and so, so tasty they will not last long. Bring out a massive platter of these on Australia Day and serve with sauce of course … tomato, BBQ, Sweet Chilli or even Salsa. They’ll be a Winner Winner Chicken Dinner everytime! Check out her CHICKEN SAUSAGE ROLLS RECIPE for the exact ingredients. These are just a few ideas for your Australia Day – we hope you enjoy them! Will you be cooking up a storm … or heading somewhere local with a picnic in two to enjoy the Australia Day festivities? Oh yummy, so,e great inspiration here. chicken sausage rolls I will try next time! I have to give the sausage rolls a try they sound delicious. lots of good ideas for all to use. Congratulations lucky winners. I love Mum2Archer’s recipe. Going by our weather forecast we won’t need to cook a storm to have one. We’re more likely to have a total fire ban and hope for no bushfires. Happy Australia Day everyone! So many great recipes to try!! Yum! some really good recipes ther ! Happy Australia day! Yum!! My mouth is watering now! All fantastic recipes to enjoy on the long weekend! some awesome tasty treats here, cannot wait to try that sausage roll recipe – thank you for compiling and Happy Australia Day! Chicken sausage rolls go great with sesame seeds on top. I’m having lamb. It’s a splurge day on the good lamb cutlets we can’t usually afford. Lamb cutlets are indeed delicious and such a treat due to price.